On our first call with the producers, they told us a little more about Shelby's background. Shelby was born with some debilitating heath issues. 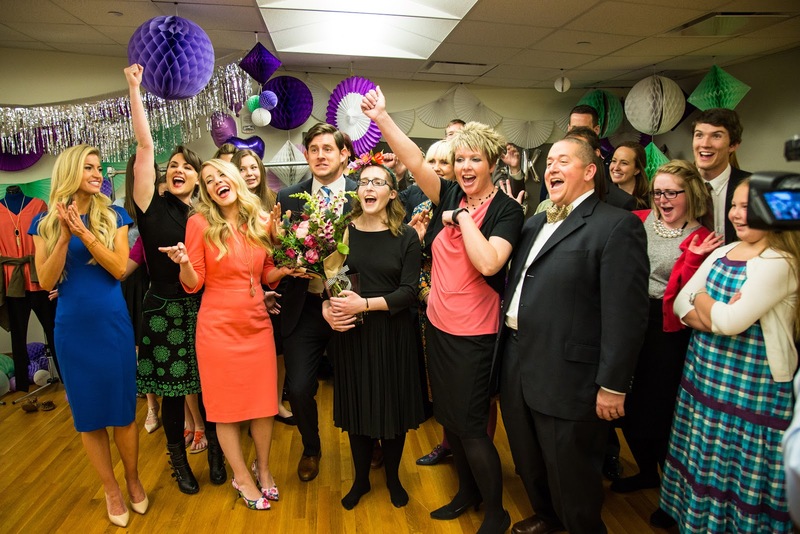 I don't want to go into too many of the details because I want you all to watch it for yourself (you can view it here), but Shelby's lifelong dream was to be able to play in the Orchestra at Temple Square. She has had a really rough few years with her health, and these dreams had to be put on hold. 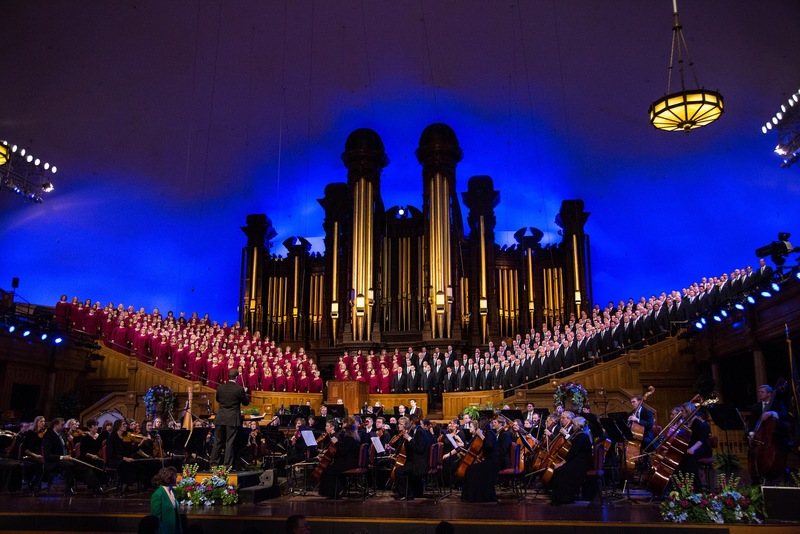 The show Random Acts was planning on surprising her with the opportunity to be able to perform with the orchestra and The Mormon Tabernacle Choir! Her dream come true! They asked me to help style her for this special performance, and hand select a brand new wardrobe for her to take home. I jumped at the chance to be involved! I flew up to Utah and met up with the crew and one of my very best friends, Abby from Twist Me Pretty, and the crazy talented Brittany from The House Lars Built. Emily and Aaron are the hosts of the show and they showed us the ropes on how we would pull this all off. There was such positive happy energy between all of us and the crew. They were all so kind and accommodating. We all shared the same goal of making the day just right for Shelby. That kindness and love for her really propelled us through the weekend of filming. Abby was in charge of doing Shelby's hair and makeup and Brittany was in charge of dressing up the space we would be filming, and giving Shelby a true party. It was such a dream team! We prepped all day Saturday before the official performance Sunday. I was given Shelby's height and measurements and a few photos to dress and style her. I wanted to make sure that she had plenty of options of dresses to choose from for the performance, so I basically ordered the entire internet. I mean...look at all those boxes! We spent Saturday morning unboxing all the supplies and getting the green room all set up. I definitely had my work cut out for me! I spent hours and hours (and hours) scouring online sourcing looks for Shelby. For the performance, she had to wear an all black long dress with long sleeves. Because of her health concerns, she also had very specific instructions as to what she could/couldn't wear. I ordered every dress I thought might work in 2 sizes just to be sure we would have one that fit. She had to have a beautiful dress that worked on the day of the performance and I literally lost sleep at night worrying about whether or not any of the options I picked would work for her. These flats were my absolute favorite and I was so excited when Shelby loved them too! This is just some of the amazing decor Brittany brought to work her magic. I loved watching her execute her vision of decorating the space! Little Eli got to fly up with me for the filming! I was so grateful to the crew for allowing me to bring him (I'm still nursing). My sister-in-law Kate lives up there and was kind enough to watch him while we filmed. He was such a dream on the flight and during filming! 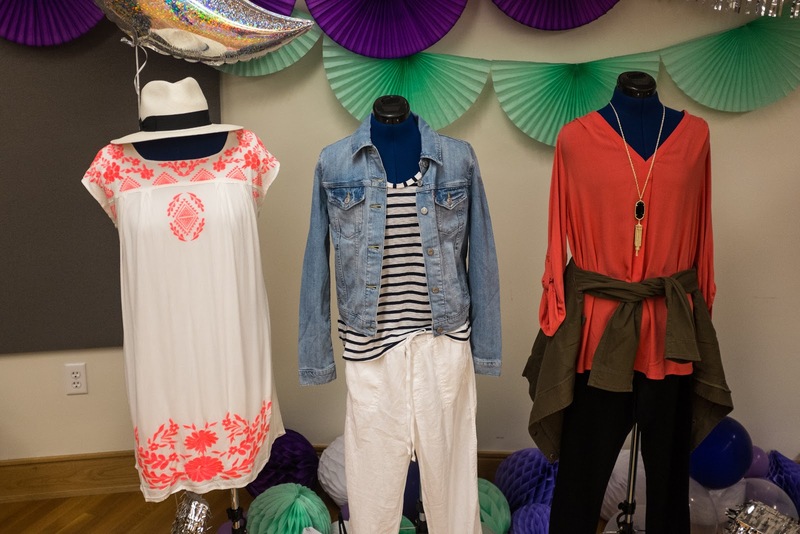 I picked out 3 additional looks that Shelby got to take home and add to her wardrobe. I tried the keep the looks all comfortable and easy to wear, but also made sure they were on trend and cute! Shopping and planning out outfits for someone else is so much fun, let me tell you! Brittany made that darling floral crown for Shelby to wear after her performance, and Abby brought along all of Sephora to transform Shelby into a beauty queen. She selected the most amazing hair tools and makeup. And Shelby got to take it all home with her! Pre show prepping bright and early Sunday morning. None of us were really sure what Shelby's reaction to all of this would be. 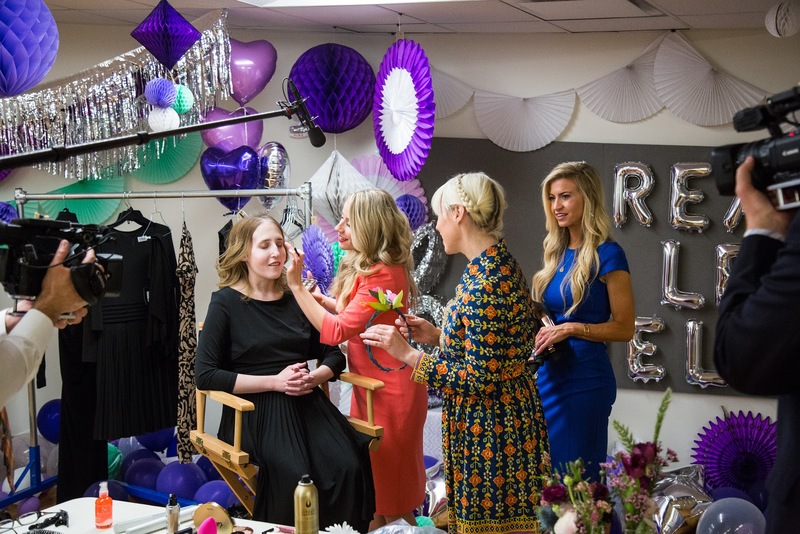 We didn't know if she would be too overwhelmed, or nervous to be ambushed with a makeover and perform right on the spot! When Shelby finally walked in the room after just being told her dream of performing with the orchestra was going to happen, we were all on emotional highs! She was so poised and so beautiful and so grateful! She kept saying "thank you! thank you!" over and over. She absolutely loved letting us pamper her and treat her like a princess. It was easy to tell what a kind and compassionate person Shelby is. Her countenance just radiated and we were all emotional when we finally got to meet her. We didn't have much time to get her dressed so I was prepped and ready to help her try on all the different options I pulled. 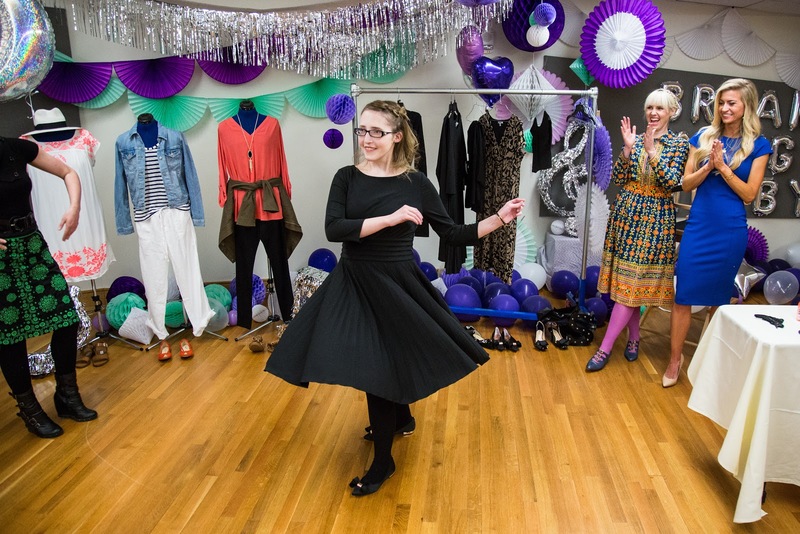 She was drawn to this cute pleated dress (it was my favorite as well) and it fit her perfectly! It was the very first dress she tried on! I can't tell you how relieved I was! Once we were all finished with her wardrobe, hair, and makeup it was show time! We didn't realize that we would actually get to sit in the audience and watch Shelby's performance and we were so thrilled! Shelby was poised and did such an amazing job. I don't know how she handled all that pressure without any notice, but she sailed through the performance! Her parents were so proud. We were all so happy for her and thrilled to be a part of such an amazing experience. After the performance Shelby got to celebrate with all of her family and friends. It was truly a joy to be involved in this show. Random Acts is full of good people wanting to help bring joy to others' lives! 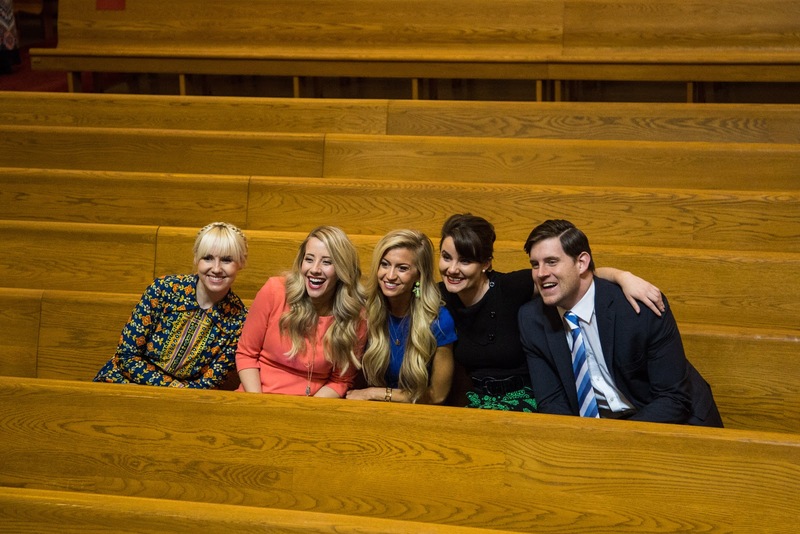 If you didn't catch the episode on BYUtv, you have to watch it! You can view it online right here. Did you watch the show? I would love to hear your thoughts on it in the comments below!